It's about time! Finally, I'm getting around to another post. Last week was spent traveling and teaching in Keller, Texas. I managed the drive in good shape, but it rained and rained and rained on me in Texas. It soon became evident that there was a leak around my new windshield when I began to smell something really funky in my car. And then I noticed that the floor on the driver's side was quite wet. After sopping up what moisture I could, I took the floor mat into my hotel room and hung it out to dry over the room heater, and bought some carpet deoderizer for the car's floor. Believe me, the glass installer got the car back as soon as I could get it there when I arrived home. The leak was found, and I'm hoping it is actually fixed. In the meantime, do you have any suggestions for permanently removing the odor from my car? Before I left on this most recent trip, I finished 3 quilt tops in one week! I think that has to be some kind of record for me, but of course, they were all in process before I added the borders, etc. The first one was the postage stamp quilt top I'd blogged about earlier. It is really, really cheery, and I loved it when I laid it out on my bed to admire it, and the sunshine coming in the window made it seem to glow. (The photo here doesn't do it justice.) 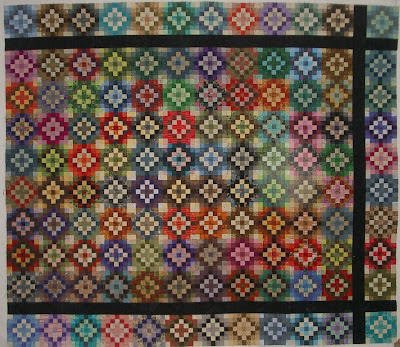 I know you're going to ask so here it is: There are a total of 5,880 individual 1" squares in this quilt top. It is designed to fit a queen-sized bed exactly with the black borders just hanging over the edge of the bed. I already have plans to make coordinating pillow shams for the quilt. There will be a second postage stamp quilt soon. Remember this design? It will be the first quilt top's sister: The second quilt is the Star and Leaf quilt (AKA Star Crystal), that I also blogged about earlier this year. Setting this one together proved to be a huge challenge. Lots and lots of Y seams, and places where 10 or more seams met gave me hours and hours of thinking through the process, and experimenting until I found a way to put it together in a satisfactory manner. This photo doesn't show the narrow inner border and wider white outer borders, but you can get the idea. 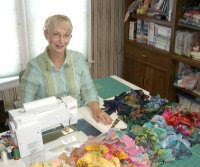 Now, I'm struggling with quilting ideas. 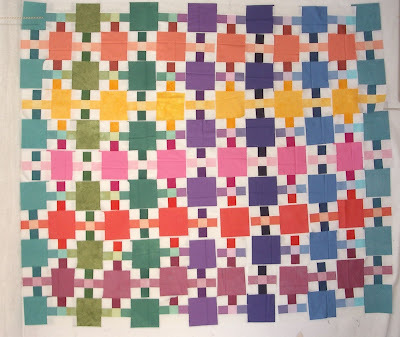 This one deserves trapunto, and lots and lots of nice quilting, don't you think? The third one was a brand new quilt top. Made from two different sizes of squares, stitching it together was really simple. The thing I most like about this one is the really bright, solid colors. This photo was taken during the design process, and was taken before the top was even sewn together. It does not show the all-white borders. Once again, with all the solid colors, and the large outer border, this one will also need elaborate quilting to make it really special. Can you tell how much fun I'm having with solids in really brilliant colors? 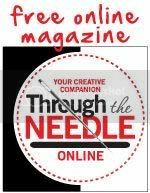 The rest of this week, I've got to finish getting teaching samples and quilts plus my wardrobe ready for the East Coast Quilter's Alliance's A Quilter's Gathering. First, I'll fly to Philadelphia for a few days with my son Kelly. 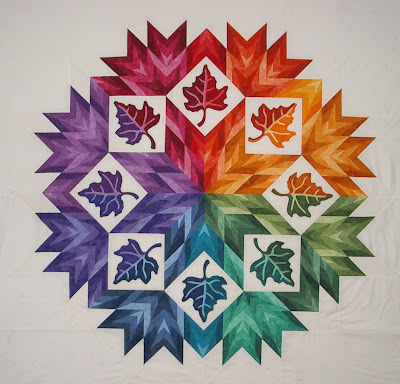 We'll be going to Lancaster County to the People's Place Quilt Museum on Saturday, passing out candy Saturday evening, the Art Museum on Sunday, and a bit of relaxing on Monday and Tuesday before flying to New Hampshire. This is my last teaching trip for the year, and I'm so looking forward to relaxing at home for the holidays and for the next couple of months. 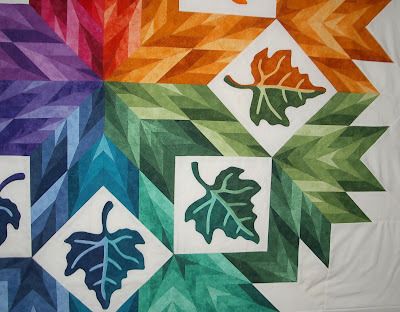 That leaf quilt is absolutely beautiful.